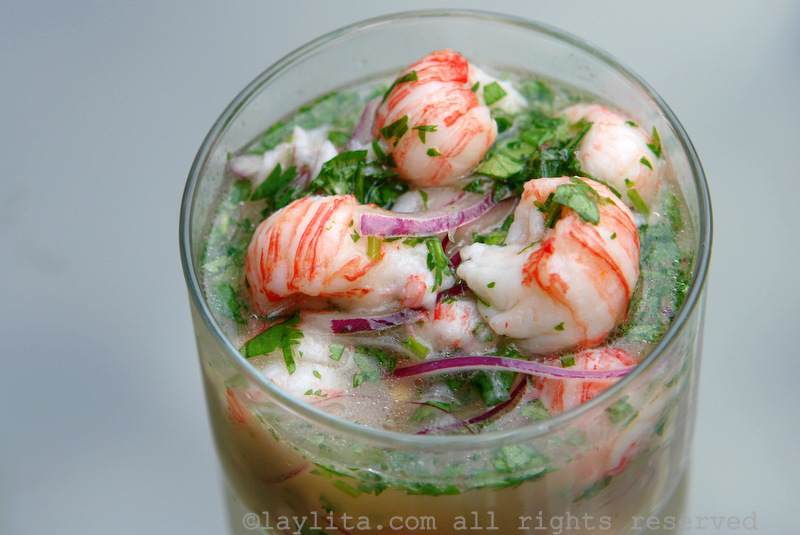 This easy recipe for langostino ceviche is made with langostinos (or shrimp or lobster), lime juice, red onions, cilantro, hot peppers, garlic, and olive oil. Langostinos, also known as squat lobster, are a type of shellfish that are related to hermit crabs. 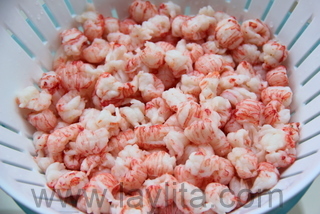 In the US, you can find langostino tails (frozen) at Trader Joe’s and Costco. In terms of taste, they are slightly sweeter than shrimp, you could say that these langostinos as not quite lobsters, but are more delicate than shrimp and have a more similar texture to lobster. 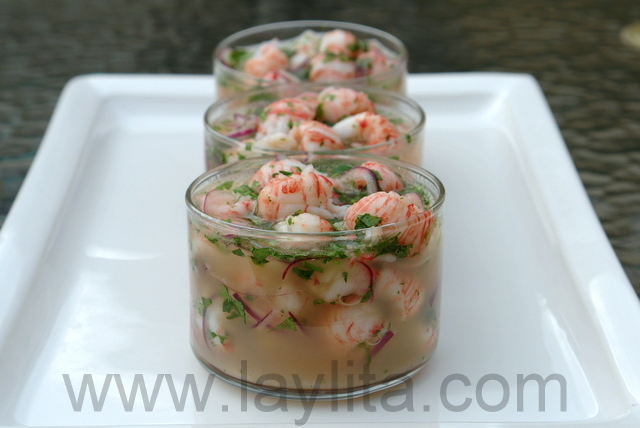 Easy recipe for langostino ceviche made with langostinos or shrimp, lime juice, red onions, cilantro, hot peppers, garlic, and olive oil. 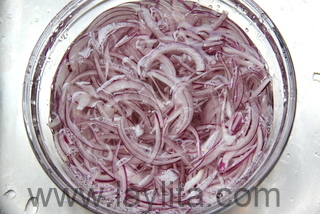 Place the sliced onions in a bowl, add some salt and cover with warm water. Let rest for about 10 minutes, drain and rinse well with cold water. 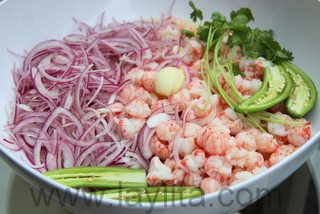 Place the cooked langostinos in a glass or plastic bowl; add the lime juice, washed onion slices, hot peppers, cilantro sprigs, garlic clove, and salt. Cover and let marinate for a couple of hours in the refrigerator. Remove the hot peppers, the cilantro springs and the garlic clove. 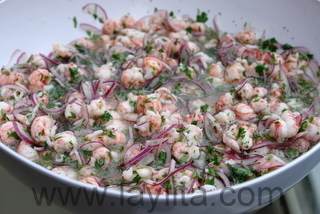 Add the cilantro and olive oil to the marinated langostinos and onions, mix well. Taste and add additional salt if needed. 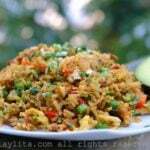 Serve with chifles, patacones or tostones, tostado corn, or popcorn. In many case cases, I personally prefer shrimp to lobster. Shrimp is more versatile and can be used in several different dishes. I do like lobster, but find it overwhelming after a few bite. I can only eat small quantities and prefer it in a recipe that mixes it with other ingredients: risotto, mashed potatoes, salads, and soups. 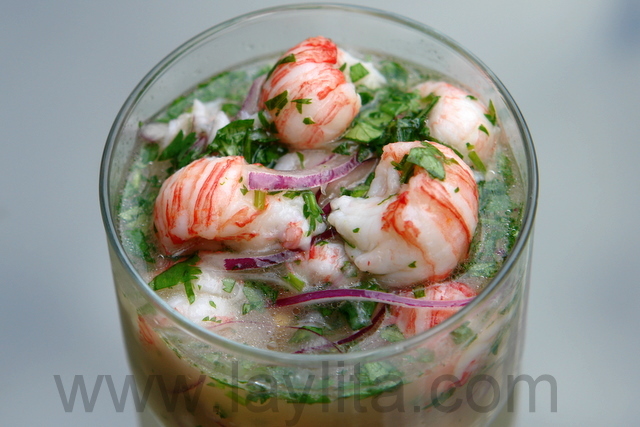 Lobster would work well in this ceviche, the lime juice help balance out of the richness of the lobster. 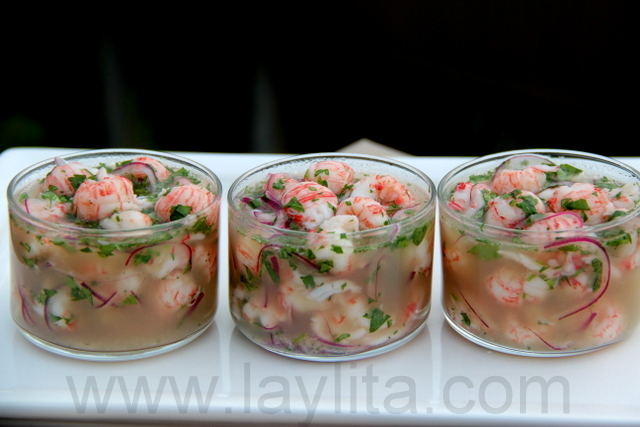 Another option for this ceviche is to use crawfish meat – and of course, good old shrimp also work fine. Langostino is a great shellfish if you want a change from shrimp, or want to take a classic shrimp dish to the next level. Langostinos are also more expensive than shrimp. 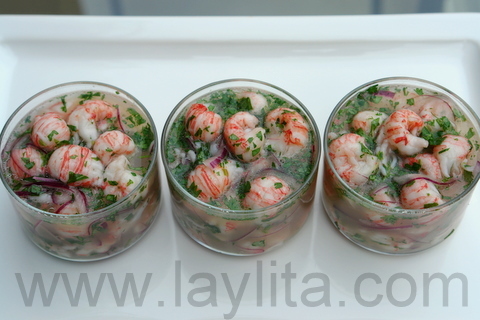 Maybe it’s because they’re becoming more popular, but prices seem to have increased in the last few years – which is why I only make this langostino ceviche for special occasions. 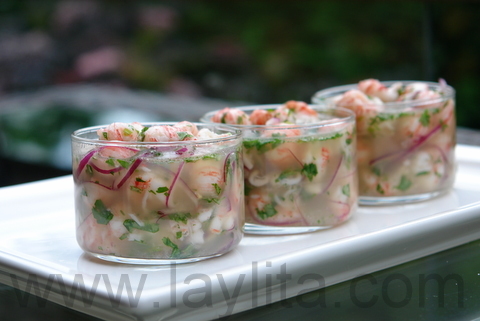 I love ceviche ( I say this every time that I post a ceviche recipe). 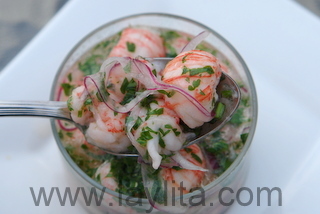 This langostino ceviche is one of my favorite ceviches, it’s very simple and doesn’t have all the other ingredients that are in a classic shrimp ceviche, but it really doesn’t need them, the langostino meat matches perfectly with the lime juice, onions and cilantro. While the ceviche is marinating, the langostino is slightly infused with hot peppers and garlic. 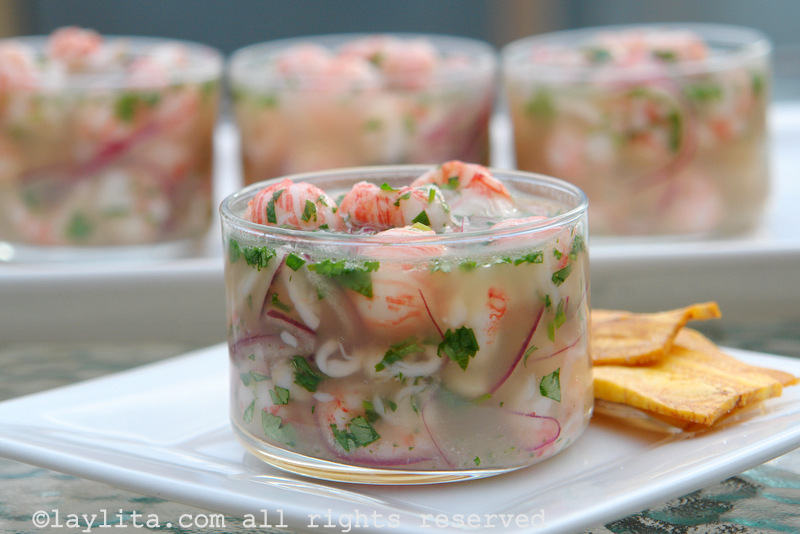 If you always wanted to try ceviche, but are skeptical to try fish ceviche because of the raw fish, then this is a great option to introduce you to ceviche. 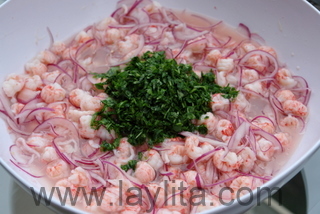 The langostinos are fully cooked, so any risk that you might face with raw fish is eliminated (and even fish ceviche prepared with quality fresh fish is relatively safe). 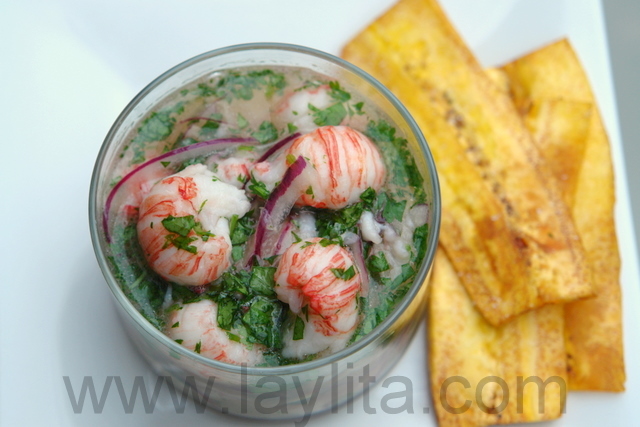 I always recommend serving ceviche with something crunchy to create a contrast with seafood, the most typical sides for ceviche are chifles or thin green banana/plantain chips. 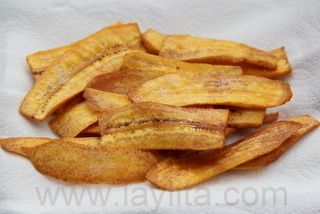 Another popular side are patacones or tostones, which are thick green plantain chips. Tostado or South American corn nuts are also a great accompaniment for ceviche. Popcorn also works well, but I would try to use one of the first options and save popcorn as the last option. One of the best parts of the ceviche is the lime juice; it absorbs the flavors of the seafood, the onion, hot peppers, garlic and cilantro. After I eat the seafood, I like to either drink the juice or mix with some crushed chifles or tostado. Mouthwatering! Wow this is mouthwatering! I never heard of langostino before. Hope I can find it. :) Looks sooooo good!!!! I love your website. I haven’t had much Latin food but now I’m glad I can try it. I made this today to take to a fiesta we had to celebrate the last day of Spanish class. My teacher, a native of Ecuador, and a special guest, who is from Peru, both raved over it. (I used shrimp because my local store doesn’t carry langostino, but I did find some frozen langostino in a Trader Joes on my way home from the fiesta, and can’t wait to make it again, this time with the langostino.) Thanks for all your recipes. I’m sure I’m pinned at least a dozen! Hi! How long did you let it marinate for? So sabroso can’t wait to make, Thank you!! 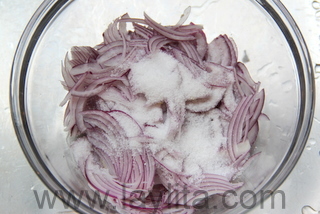 What does the salting and soaking of the onions do? Does it remove some acidity? I am considering mixing with shrimp… any thoughts? 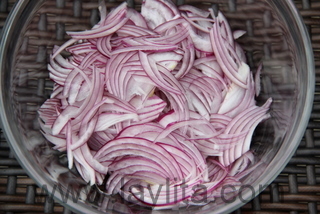 It helps remove the bitterness and strong onion taste, and also helps them absorb the lime juice better. 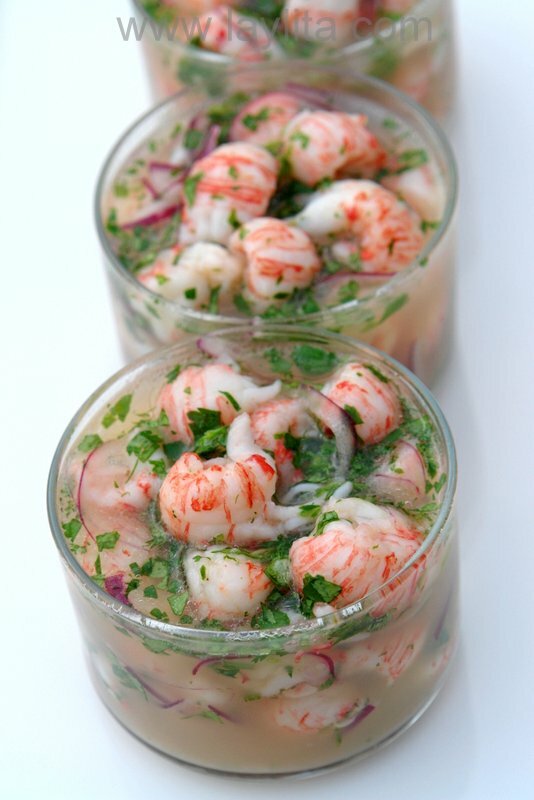 This ceviche will work great with shrimp. Thank you so much. Love the site. Lots of photos is a great help.Have a beautiful Christmas. Me encanta tu blog :) Soy colombiana y vivo en Texas. Esta comida se parece mucho a la colombiana y a la peruana,muchas de estas recetas las hace mi mami, pero aca en Texas no he podido que me queden igual…asi que habia dejado de intentar por mucho tiempo. Ahora con este blog voy a poder tratar otra vez. :) voy a ensayar este ceviche y el ceviche de mango para el Thanksgiving. Muchas gracias, que buena pagina!! Doesn’t leaving the fish in the lime juice make it rubbery? If the lime is what’s cooking the shrimp/langostino, it seems two hours is too long. I keep seeing different things on this subject… some chefs say fifteen minutes, others say a couple of hours. I suppose I can experiment but this fish is so expensive and I don’t want to lose any of it. 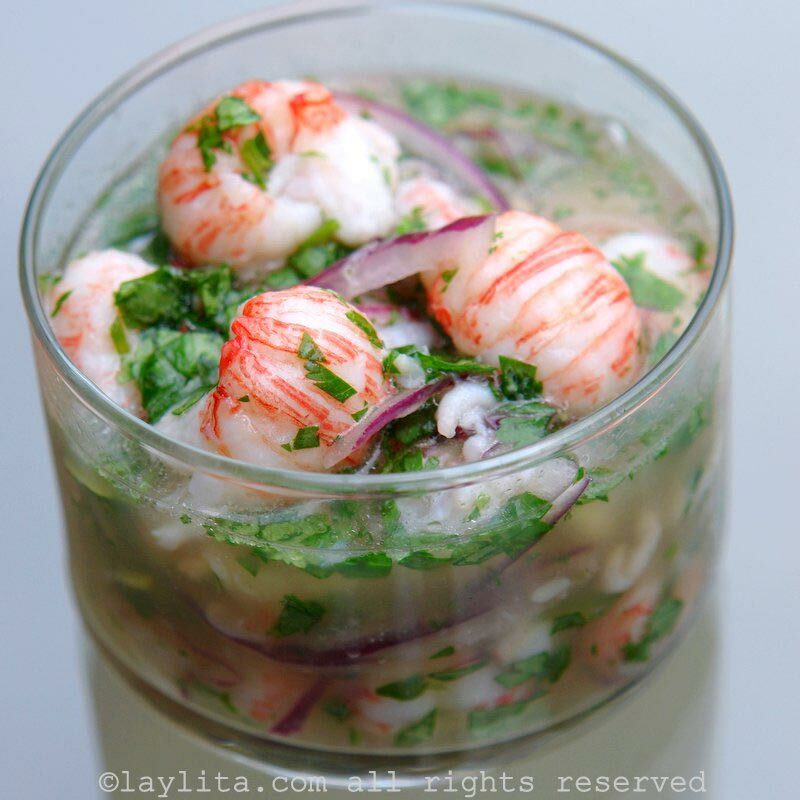 Wendy – This recipe is for langostino ceviche, not fish ceviche. 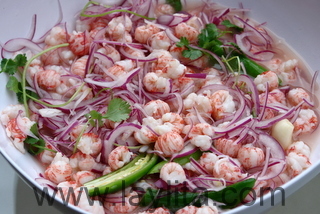 Langostinos are shellfish and this recipe uses fully cooked langostinos. 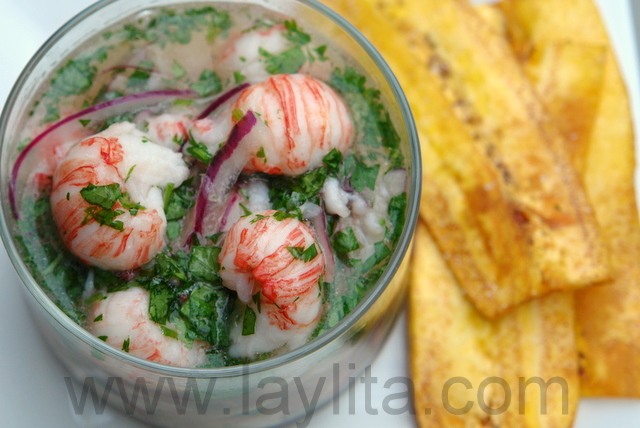 The lime juice marinates the langostinos, it needs to marinate for 1-2 hours so that the flavors of the onions, langostinos and lime juice combine well and get that delicious ceviche flavor. You can leave it marinating for less time, but the flavor won’t be as good. We currently live in Germany and I am not able to find Langostino nor anything that looks remotely to it. I was only able to locate lobster (fresh, frozen, raw and fully cooked), lobster tails (raw and fully cooked) and of a variety of shrimp (fresh, frozen, fully cooked, and raw). Can I simply substitute large or jumbo shrimp and follow the remainder of the recipe as is? Thank you in advance for your response. BTW, I love your website and have tried many recipes from it with success! Please continue to post and share. Hi Mari – Yes, of course you can, this recipe will work with pretty much any type of cooked shellfish. Great website !! Thanks for sharing . My question is can we chop garlic & hot pepper finely & leave in the ceviche ? What do you think ? Hi Pat – I do add chopped hot peppers when I know that everyone likes the extra heat, but not usually the garlic, but if you love garlic you can try it. Also, if you have fresh hot peppers, they add more flavor than the ones that were in the lime juice. OMG I am so going to try this recipe. It looks so amazingly delicious, and with those mariquitas even better! Tu sitio web me encanta. Tengo una pregunta, quiero hacer cebiche pero aqui en Suiza encontrar limas es imposible. Lo unico que puedo encontrar son limones amarillos, a esos te refieres cuando dices limes? 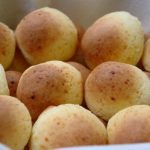 Muchos saludos y sigue adelante con tus recetas! Hola Veronica, Los limes son los limones verdes, si el marisco ya esta cocinado (como en este ceviche) entonces puedes usar los limones amarillos. Para el ceviche de pescado los limes o limones verdes (como el limon sutil en Ecuador) lo cocinan mas rapido. Saludos! This is a great recipe. 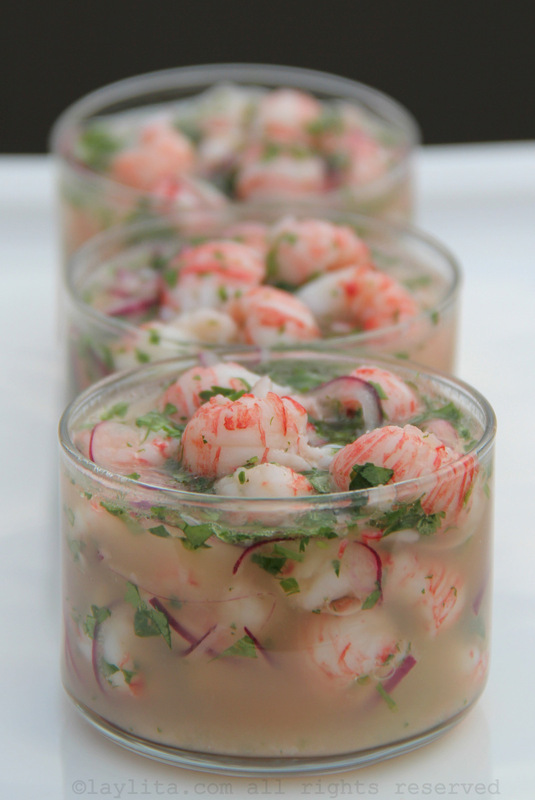 We have been importing Chilean langostino since 1982 as one of the first companies to bring them to the United States. I think I may prepare this recipe for our booth at our next food show I work. Our first container of Argentine Red Shrimp will arrive this month and I think they would give langostino a run for their money in this recipe. Argentine red shrimp are about the best cold water shrimp I have eaten. Thank you for sharing your great recipe. 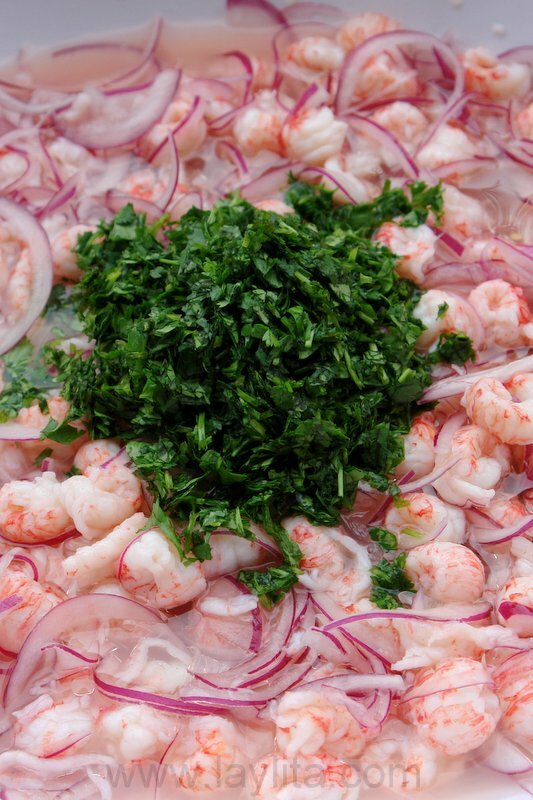 Where are you getting these Argentine Red Shrimp? I only know of one company sourcing them here in the states. I added some fresh, diced Haas Avocado and some ground cumin to it just before serving. This is so much better if chilled overnight and served the next day. Your recipe seems real and simple, yet delicious and elegantly done. Great job. My first time on your blog and I’m very impressed. Congrats on such a good job. Since lime is such a crucial ingredient, and since there is so much of it, would you say it’s important to freshly squeeze the juice, or does store-bought lime juice suffice? Hi Heather – Freshly squeezed only, the taste of store bought lime juice tends to be so fake that I wouldn’t use for a dish like ceviche where you want the taste of lime juice is so important. Can’t wait to give this recipe a try. 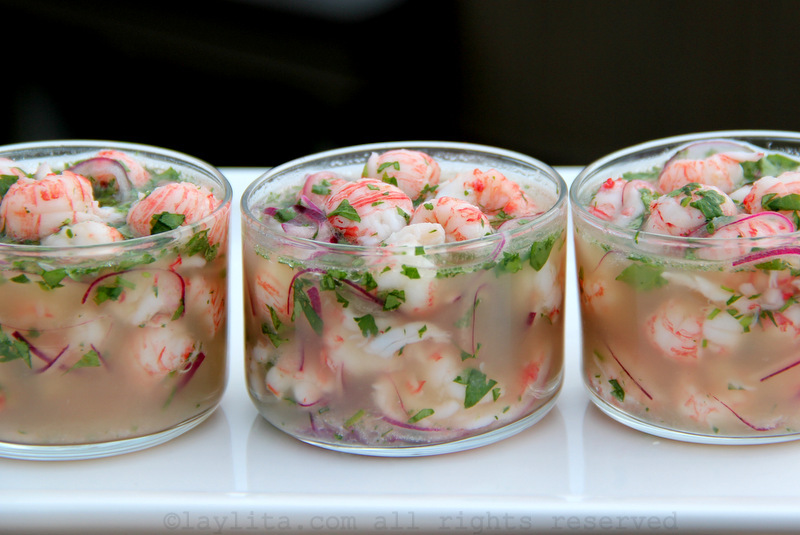 This ceviche looks absolutely divine. Gorgeous! 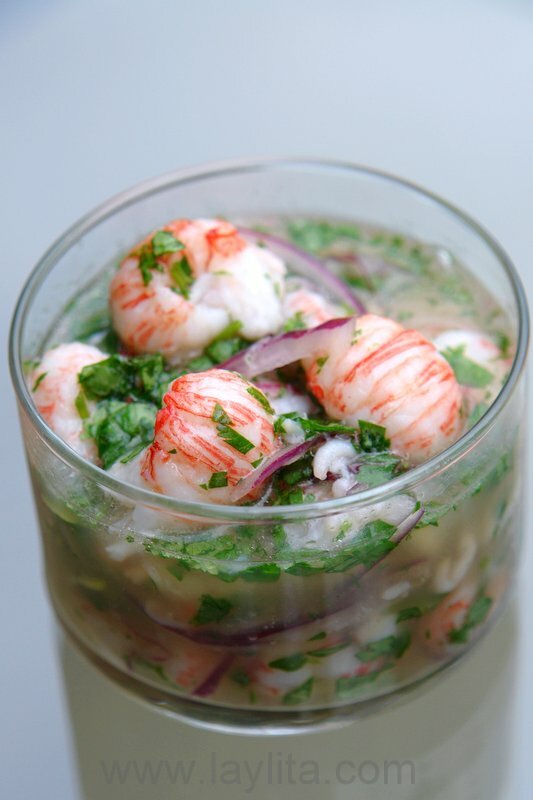 I love ceviche too — lobster OR shrimp. Now I’ll be on the lookout for their cousin, the langostino.